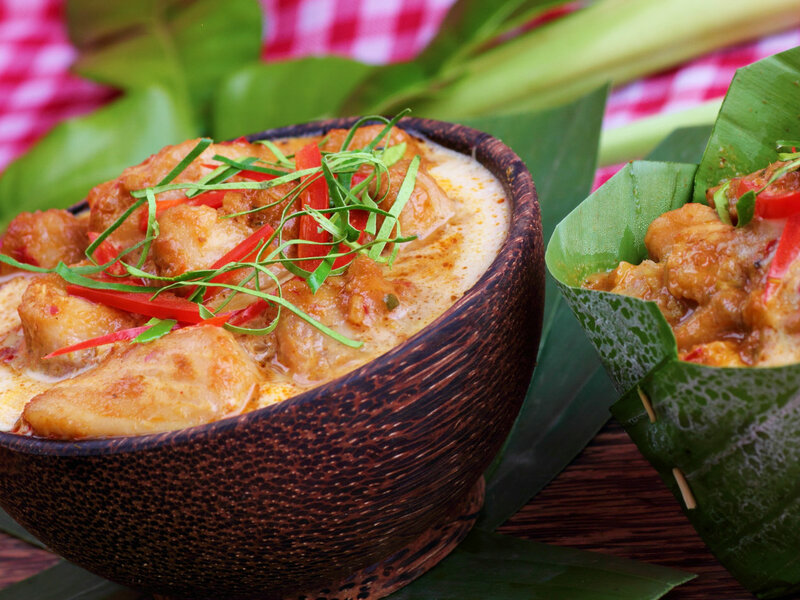 Amok is a coconut curry, gently steamed in banana leaves and is considered by many to be the national dish of Cambodia. It’s usually made with fish, but chicken, tofu and even snails are used as the main protein source. 5 leaves kaffir lime thinly sliced. Save 2for garnishing. Also called Makrut lime leaf. Can be replaced by a squeeze of fresh lime. In a mortar, pound the lemongrass, kaffir lime leaves, galangal, turmeric, garlic and salt into a fine paste. This is called the kroeung. If you are using a food processor, put the easiest-to-grind ingredients in first. The liquid that forms will help to process the other harder-to-blend ingredients or add a few teaspoons of water to make the blending easier. Add shrimp paste and dried chili. Continue to pound until well mixed. Put aside. If you want to serve the Amok in a traditional fashion, take a large banana leaf and cut out 4 square pieces of 20 cm each. Place all the leaves together and cut off the corner tips diagonally. Each dish container will need two squares to prevent the mixture from leaking when steaming. Place two squares together and fold the long sides up about 3 cm to pleat and make a corner. Using a short toothpick, pin both the folded parts together. Repeat this for all sides of the leaves until you get a square bowl. In a wok, heat up the vegetable oil. Add chopped garlic and shallot, stirring until fragrant. Add the kroeung and 3 tablespoons of coconut cream. Then add the palm sugar, fish sauce, salt, chicken powder and fish. Cook for about a minute, add the remaining coconut cream (keep one tablespoon for the final garnish) and stir until it thickens and reaches boiling point. Remove from the heat and set aside. Place nhor leaves at the bottom of each serving bowl. Pour the cooked fish mixture over and add the egg yolk. Pour the remaining coconut cream and top the dish with thinly sliced kaffir lime leafs and cayenne pepper. In a steamer, place the Amok mixture and steam for 7-10 minutes. Serve immediately with steamed rice or bread. You can use chicken as a substitute but you will need to cook it slightly longer. For vegetarians, you can use tofu and more soy sauce (or Golden Mountain Sauce) to substitute the shrimp paste. In Cambodia, Amok is steamed and served in bowls made out of banana leafs. Coconut shells, scooped out pumpkins or ceramic bowls can also be used. Keo Sokhom is from Cambodia. She loves cooking and runs a food blog: asianfoodguide. Keo grew up in a poor village and didn’t really have much to eat or the luxury to sample various types of food, until her mid-twenties. Preparing food and eating was just all about survival. Since then, she has had the opportunity to try many types of food from different provinces in Cambodia and Asia. The last four years she has been busy learning and experimenting many recipes. Her mission is to discover and document Cambodian cuisines and recipes for future generations. Photography by Nabilkannan.